This Saturday at 1 O’Clock, Kansas State will take on Texas in Austin. In the first go round between these two teams, K-State led most of the way and then almost blew the lead with a bunch of missed free throws. Texas had the chance to tie or win the game on their final possession but Martavious Irving had a big steal that led to a Rodney McGruder dunk at the other end. Here’s what to look for as K-State goes up against the Horns at 1 o’clock Saturday. 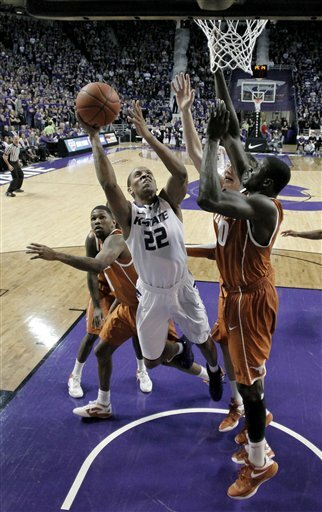 Frontcourt: Kansas State has a bunch of bodies to throw at the Longhorn front line. The Horns have a few good big men, but they shouldn’t be able to hang with Jamar Samuels and co. Expect the Wildcats front line to dominate. Backcourt: Perhaps no one in the conference had been more efficient than J’Covan Brown of Texas. He is the most prolific scorer in the Big 12. He also has freshman Myck Kabongo as a nice compliment to the backcourt. KSU has Rodney McGruder who has been in a bit of a slump and Angel Rodriguez who has been on fire. I give an edge to the Horns here. Bench: KSU has Shane Southwell who is coming off a career night and a big time role player in Adrian Diaz. Texas has a few players that can come off the bench, but none that play the same way K-State’s bench does. Prediction: Kansas State has bounced back nicely from a couple losses and Texas is playing some good ball right now. You have to take into account also that Frank Martin and every player on K-State’s team have never lost in Austin. I think KSU keeps that streak going. This entry was posted in Basketball, Home, Midwest.